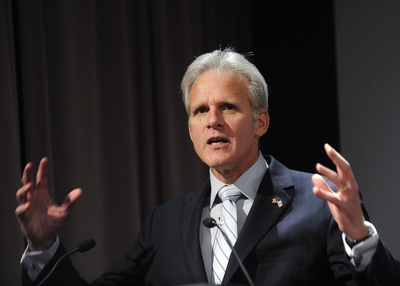 On February 21, inFOCUS editor Matthew RJ Brodsky interviewed Ambassador Michael Oren. Born and raised in New Jersey before attending Princeton and Columbia universities, Dr. Oren became an officer in the IDF serving multiple tours, and was a liaison to the U.S. Sixth Fleet during the Gulf War. The Ambassador is also the author of two New York Times best-sellers, Power, Faith, and Fantasy: America in the Middle East from 1776 to the Present and Six Days of War. The Jerusalem Post named Dr. Oren as one of the world's ten most influential Jews. iF: The relationship between Israel and Greece and Cyprus has been elevated tremendously over the past three or four years, generally because of a common interest in energy exploration and extraction. In what other ways have Israel and Greece strengthened their political and military relations? MO: Jews and Greeks share a 3,000-year history. Anywhere you go in the State of Israel you'll find evidence of how Jews and Greeks lived and flourished together in antiquity. For the last 20 years, Greece and Israel have enjoyed excellent relations. Now, that relationship has truly blossomed into the fields of energy, agriculture, trade, military cooperation, and tourism. This year alone, some 400,000 Israelis visited Greece, and we expect even more next year. Our friendship finds expression here, in the United States, in the bi-partisan Congressional Hellenic-Israel Alliance that was recently announced, chaired by Reps. Ted Deutch and Gus M. Bilirakus. We look forward to continuing to foster this relationship and expand our cooperation. iF: How have Israeli-American relations, both political and military-to-military relations, changed in the past five years? What do you hope to accomplish with President Obama during his second term? MO: When I came to this job four years ago, I knew the alliance was strong, but I had no idea just how vast and dynamic it is. Our ties are not restricted to the political and military, but rather they extend to broad commercial and agricultural ventures, unbelievable humanitarian projects, intelligence sharing, and security coordination. I would say in the past five years, these bonds have only become stronger and grown wider. We will work closely with President Obama to further strengthen this unshakable alliance, and his visit to Israel in the spring will be a great start. iF: How would you characterize the working relationship between the PA security services and the IDF in the West Bank? Is the "land for peace" formula still relevant today? MO: The IDF works closely with the PA security services in the West Bank. The fact that there is even a working relationship is an incredible achievement, one that was unthinkable ten years ago. It's also a testament to Israel's willingness to negotiate a two-state solution based on mutual recognition and security. Supporting the PA security forces was a major risk on our part, but it's the type of risk that Israel is willing to take for peace. I think the land for peace formula is still relevant today and we hope President Abbas will take us up on our offer to restart peace negotiations immediately, without delay and without preconditions, in Jerusalem, in Ramallah, in Washington, DC, wherever. We are prepared to put all the issues on the table and to take risks for peace. iF: How has Israel's security situation changed as a result of two years of Arab upheaval? MO: Though the developments in the past two years have certainly made us alter some of our defenses, Israel remains prepared and able to defend itself. In the south, we are building a border fence in record time, and in the north our soldiers are monitoring the situation in Syria carefully. With generous support from the United States, which we truly appreciate, we have also mobilized our Iron Dome anti-missile system, which saves lives and gives more time for diplomacy, as we saw during Operation Pillar of Defense. Though it is not a game-ender, Iron Dome is certainly a security game-changer. iF: Media reports have noticed recently the deployment of more Iron Dome batteries in northern Israel. What is the situation between Israel and Lebanon these days and what explains the higher threat level? MO: The deployment of Iron Dome in different parts of Israel is merely part of our standard operational rotation. We are monitoring the situation in Lebanon closely. Of course we need to keep our eye on Hezbollah, which Bulgaria recently found to be guilty in the Burgas bus bombing last summer. It has amassed tens of thousands of missiles and armaments from Iran and strives to murder Israelis and Americans all over the world. We hope that Europe will heed the Obama administration's calls to label Hezbollah a terrorist organization. iF: Thank you for your time, ambassador.